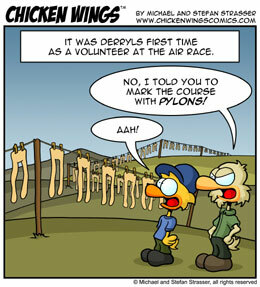 Chicken Wings is available for licensing and syndication directly through us. You can choose from the material on our website or our books and request a specific strip, but we can also make specific suggestions to a certain topic you name us. For regular customers, it usually works like this: At the beginning of each month, we will send you new and fresh content (comic strips that haven’t been published on our website yet). Depending on the frequency of your publication, we also send you more strips than you print, to give you the convenience of being able to choose and have a backup. We only charge you for the strip you actually print. Our syndication rates are very reasonable. Please contact us for a quote! All images are provided as high quality / high resolution JPEG or TIFF files and usually sent via Email. You can choose the format, and we also offer you the option to choose a certain type of content from within our comic stock. We can provide you with material that is less or more aviation specific, more centered around the management aspect of aviation or exclusively focused on either helicopters, airplanes or ATC, etc. The possibilities how to use our comic strips and cartoons are endless. Prices depend on purpose, circulation/reach and if you are a for-profit or non-profit operation. Simply get in touch with us, tell us what you need the comic for and we will give you a quote. All inquiries, big or small, will be handled quickly and professionally! We also do custom jobs and commissioned art. So if you want to use our characters for merchandising, need a very special gift, nose art design or a specific comic on a special subject, we are always open for business! Stefan is also available for other comics, illustriations, graphic design, corporate design, webdesign etc. If you want to send a Chicken Wings strip to friends via email, post it on a message board, or use the occasional strip on your blog, please just go ahead! Also, if you are the editor of your local EAA chapter’s or flight club’s newsletter that goes out to about a hundred people and is non-profit, feel free to use the material from our website free of charge. In return, a small reference or link to us would be appreciated. We only ask you to not upload any of our comics and cartoons on Facebook or any other website where the terms and conditions say that they would then own our material. Hello there, I’m enquiring about licensing. I’m an aviation enthusiast from Italy, in the process of designing and printing a paper daily planner for 2014. It shall be distributed free with one of our major magazines in Italy but also sold through a website. It’s not a big profit project, just a small idea to get me out of unemployment and pay my flight training. In the agenda I would like to include a single panel of ChickenWings on every week. So this would total about 52 cartoons. Is it possible to obtain free licencing, or can you please give me a quote? As a long time fan of your work, I would love a quote to use a cartoon now and again in our members’ newsletter. We are a 501 (c) (7) aero club in Boise Idaho with a membership of about 140 active members and wider membership in our newsletter. We have a mock ramp check coming up that your ramp check cartoon would be great for!